Installing a brick slip feature wall in the traditional manner using 10mm T Spacers and tile adhesive is fine for relatively small spaces such as a chimney breast or fire surround. On areas of larger proportions such as an extension or retail display wall, it makes sense to consider a tracking system or even pre-fabricated brick slip panels. Using a tracking system can cut installation time of brick cladding by more than half! 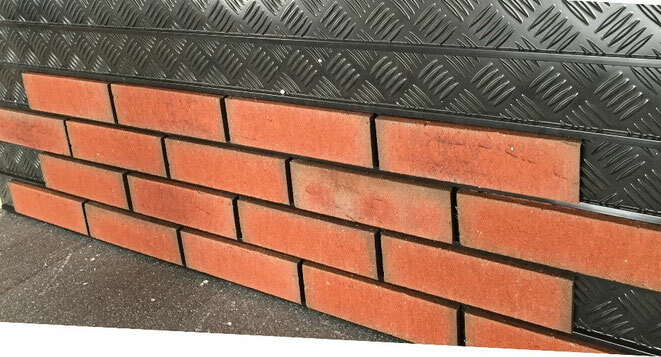 Our tracking system is made up of sheets of 1mm thick HIPS which incorporate ribbed guides suitable for mounting 65mm - 68mm brick slips. Sheets can be supplied with or without an insulated backing panel, depending upon your projects thermal requirements. Sheets and panels are typically sized 1200mm x 2400mm or 1200mm x 1200mm depending upon your preference and what works best for on site storage. 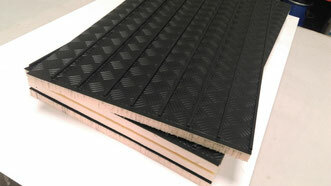 Insulated backing panels of 17.5mm XPS or 50mm XPS are offered as standard, though other backing materials such as EPS, OSB and cement particle board are available upon request. Tracking panels are suitable for fixing to most building substrates including traditional brick or breeze, or more modern building techniques such as Insulated Concrete Form (ICF) or Structural Insulated Panels (SIPS). Each 1200mm x 2400mm tracking sheet/panel typically requires 36 mechanic fixings appropriate for the substrate to which it is being attached. Care should be taken to ensure panels are affixed to maintain a horizontal level, applying a suitable weatherproof duct tape over the joints of adjoining panels to maximise protection of the building substrate. Once the tracking panels are in place, application of brick slips can commence. Make sure the brick slips and tracking sheets are dry and clear of dust. To determine the layout of the brick slips it's best to commence at the corner of the area to be clad which is most in view. 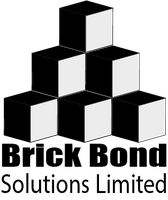 If more than one elevation is being clad and includes and external corner, commence by placing a couple of corner pistols at alternating lengths over 2 courses. Place these initially without the application of adhesive to enable adjustment. Now place brick slips along the remaining course lengths to check their fit and understand any cuts required. It's best to try keep the cuts to a minimum to maximise speed of install. 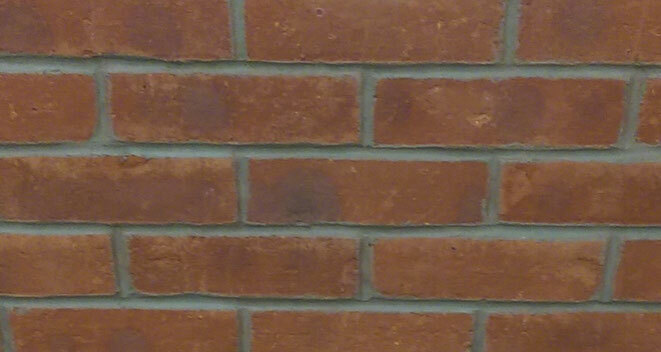 Once you're happy with the layout, brick slips can now be adhered using specialist adhesive. Avoid application during extreme cold conditions as this, along with high humidity can affect curing time. Apply a 5mm bead of adhesive in a sine wave shape approximately between 1/3 and 2/3 the height of each tracking guide. It's best to apply no more than one square metre of adhesive before fixing the brick slips to avoid the possibility of premature curing. You'll get a feel for how this can be increased once you get into it. Make sure all brick slips are sat on the lower tracking guide to ensure alignment and that the texture of the brick slip face is such that any rain water would flow off the face rather than sit in any voids within the brick face. This will not only maintain a consistent look of the brick facade but will also maximise longevity. Now the brick slips are installed its time to apply the finishing touches. To maximise speed, it's best to select a ready mix mortar suitable for application via a mortar piping bag. Ensure the colour selected is appropriate for the brick type and following the manufacturer recommended mixing instructions. Try applying the mortar to a small area in least view using the grouting bag to familiarise yourself with the process. When suitably dry, tool the mortar to ensure no holes or air pockets are present and ensure that the finished colour is acceptable. Now perform the process across the remaining area. When complete, allow 48 hours for the mortar to dry. If necessary clean any residue with clean water or masonry cleaner. Ensure to test out on a small test area if using the latter.